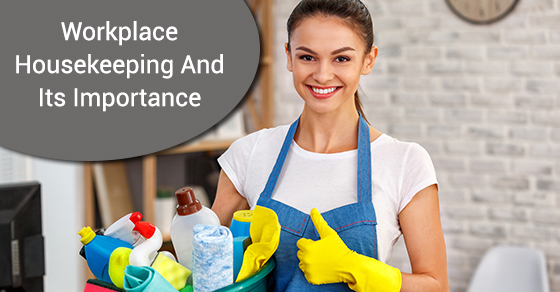 Housekeeping in a work environment means more than just dusting off shelves or running a mop across a floor. Proper housekeeping in workplaces ensures a safe work environment, and can go a long way to making sure employees are safe and injuries are infrequent. In addition, a workplace that is clean and well organized makes a great first impression on visitors. Every workplace safety program should have a place for housekeeping, and should get help from employees and a commitment from management. Work areas should be kept clear of clutter. They should be clean and sanitary—that includes areas like storage rooms and service areas. Floors should always be kept clean and dry. Where water is used, there should be adequate drainage. Materials like grease and oil should be cleaned up from common areas as soon as possible, using proper protocols. Floor coverings like mats should be used in dry areas, and floors should be kept clear of nails, holes, loose boards, or splinters. Proper housekeeping services keep materials that are combustible from accumulating in the work environment. Housekeeping will make sure that all combustible items are in metal receptacles and removed from the premises at the end of each day. If dust covers more than five percent of a work room surface, it can create an explosion hazard. A workplace that creates dust, a woodworking shop, for instance, should be tested by an industrial hygienist for air quality. Housekeeping in these areas should include frequent vacuuming with an industrial vacuum, or washing the area down with water. Cluttered workplaces may lead to injuries since employees have space limitations. It is also more difficult to set up workstations in cluttered spaces, and injuries could occur from more twisting of the body, rather than moving around entirely. If employees return equipment after use, clutter is less likely to happen. Disposing of items and materials that are no longer being used is also helpful. Emergency exits, aisles, and stairwells should also be kept clear of items. Trash cans should be emptied when full and not when they’re overflowing. Housekeeping policies should be written down and accessible to all employees. Having them written makes them more formal. The document should make mention of specific cleaners, methods, and tools to be used in various areas. It makes it easier to train those who work in housekeeping services.